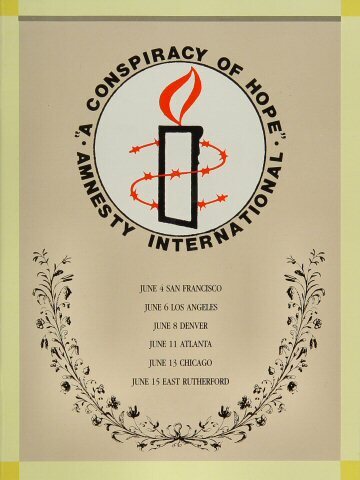 A Conspiracy of Hope was a short tour of six benefit concerts on behalf of Amnesty International that took place in the United States during June 1986. The purpose of the tour was not to raise funds but rather to increase awareness of human rights and of Amnesty's work on its 25th anniversary. The shows were headlined by U2, Sting and Bryan Adams and also featured Peter Gabriel, Lou Reed, Joan Baez, and The Neville Brothers. The last three shows featured a reunion of The Police. At a press conferences in each city, at related media events, and through their music at the concerts themselves, the artists engaged with the public on themes of human rights and human dignity. The six concerts were the first of what subsequently became known collectively as the Human Rights Concerts – a series of music events and tours staged by Amnesty International USA between 1986–1998. The tour was conceived by the Executive Director of Amnesty International's U.S. section, Jack Healey. The tour was run by famed rock promotor Bill Graham, who served as executive producer along with Healey and Mary Daly, also of Amnesty. James Radner was "Concerts for Freedom" manager for the tour. In developing the tour, Healey drew on his relationship with Martin Lewis who had first recruited rock musicians such as Pete Townshend, Sting and Peter Gabriel to work with Amnesty several years before for The Secret Policeman's Ball's series of benefit shows in England (1976–1981). Tickets for some of the shows were sold by mail-order lottery, a method popular in the 1970s for high-demand shows but here used for pretty much the last time, with computerized services such as Ticketron rapidly taking over. The concert in Denver was the only show that did not sell out, even with most of the top names on the bill. The local promoter blamed the title of the concert for radio stations believing there truly was a conspiracy. 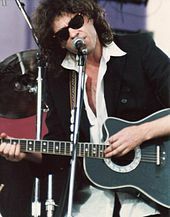 Bob Geldof performing at the Conspiracy of Hope concert on June 15, 1986, in East Rutherford, New Jersey. The final show at Giants Stadium was an all-day event, running from noon until 11 p.m., at an outdoor stadium rather than the indoor arenas used for the first five concerts. The following additional artists performed at this concert (in order): John Eddie (with guests Max Weinberg and 14 Karat Soul), Third World, The Hooters, Peter Paul & Mary, Little Steven (with guests Darlene Love and John Waite), Bob Geldof (also with guests Darlene Love, Paul Schaeffer, and John Waite), Stanley Jordan, Joan Armatrading, Jackson Browne, Rubén Blades (with Fela and Carlos Santana), Nona Hendryx, Yoko Ono, Howard Jones, and Miles Davis. The show then continued with the regular performers (in order) of The Neville Brothers, Joan Baez (Baez and the Nevilles also performed a number of songs together), Lou Reed, Peter Gabriel, Bryan Adams, Joni Mitchell (special to NJ), U2, The Police (with Bono during the song Invisible Sun) and finally everyone came out together to perform "I Shall Be Released". Stage introductions were made by Bill Graham, Senator Bill Bradley, Robert De Niro, Christopher Reeve, Michael J. Fox, Daryl Hannah and Muhammad Ali. The show was televised in its entirety by MTV, with the final three hours syndicated on broadcast television by Viacom. Westwood One aired the concert as a live radio broadcast. Pre-taped public service announcements about human rights by prominent figures in the entertainment world were presented on giant video screens and during the television broadcast. Jackson Browne had also performed at the San Francisco and Los Angeles shows. Robin Williams had performed an impromptu stand-up set at the Chicago show. Madonna and Sean Penn introduced Bryan Adams at the opening night in San Francisco. The pioneer of rock music for Amnesty, Pete Townshend, was scheduled to perform at the Giants Stadium concert, but had to cancel at the last moment when his father, Cliff Townshend, became gravely ill, necessitating his immediate return to London. This would have been Townshend's first ever US solo appearance. 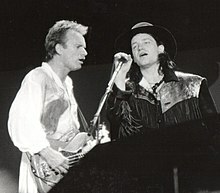 Sting and Bono performing "Invisible Sun" on June 15, 1986, at Giants Stadium. The tour enhanced the growing stature of both Peter Gabriel and U2, who were on upswings of popularity and whose "Shock the Monkey" and "Bad" respectively showed percussive, hypnotic power in large settings. Sting was originally slated for the tour as a solo performer with his touring band, but he reconvened The Police for the final three concerts (with their first appearance, in Atlanta, being unannounced) to further assist Amnesty's fund-raising and profile-raising with the enhanced value of a Police reunion. These were the last public Police performances until their Rock and Roll Hall of Fame induction in 2003. 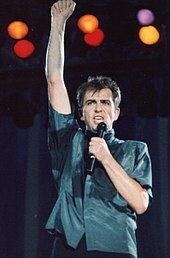 Peter Gabriel performing on June 15, 1986, in East Rutherford, New Jersey. Inevitably there were some who wondered whether attendees were understanding the message of the event or simply there for the music. A Philadelphia rock radio station sent an interviewer into the Giants Stadium concessions line, who seemed shocked to encounter an audience member who not only knew what Amnesty was but was a member. Bono addressed the doubters and cynics in an interview in Rolling Stone shortly before the tour began in which he said that he knew first-hand the value of attending such shows: "The audience is going to be great. I know that because I was part of that audience once. I saw 'The Secret Policeman's Ball' and it became a part of me ... It sowed a seed." On Monday June 16, the morning after the final show at Giants Stadium in New Jersey, Sting, Peter Gabriel, tour promoter Bill Graham and Amnesty director Jack Healey were guests on the Today Show. Host Bryant Gumbel asked, "I don’t think any of us would quibble about the worth of the cause but what leads you to believe that anybody left with anything more than a smile?" I've been a member of Amnesty for five years and a supporter because of an entertainment show which was called 'The Secret Policeman's Ball' which I was involved in. And before that I didn’t know about Amnesty's work and so in a sense I’m a success story. I know that these kind of events work. I’m sure that there were 80,000 people there last night a good proportion of them will want to be supporters and who will want to carry on the work. One month after the tour, the membership of Amnesty International in the United States had increased by 45,000 members. Concert-goers had been asked to send appeals for freedom on behalf of six prisoners of conscience, two of whom were released within months after the tour. Lou Reed performing on June 15, 1986, in East Rutherford, New Jersey. ^ David Fricke (June 19, 1986). "Amnesty International: Caravan for Human Rights". Rolling Stone (476). Retrieved May 15, 2015. ^ ovian29 (22 April 2008). "Peter Gabriel Tv Interview On The Human Rights Tour". Retrieved 13 April 2018 – via YouTube.